Informal caregivers of veterans are providing care for a population whose specialized care needs require increased investments on the part of caregivers and for longer durations. Empirical evidence shows negative mental health effects on these caregivers at rates that outpace those seen in caregivers in the general population. With a growing need and limited resources, effective interventions are needed to improve mental health outcomes in this special population of caregivers. This pilot, randomized control trial tested the effectiveness of a mindfulness-based intervention at improving perceived stress, depressive symptoms, anxiety, and worry compared to waitlist controls in a sample of 23 caregivers of veterans. The Mann-Whitney U tests used to determine whether groups differed in change scores (post minus pre) indicated that there were significant differences between the mindfulness and waitlist control group in perceived stress (U = 21.5, p = .006, r = .57), anxiety (U = 24.0, p = .009, r = .54), and worry (U = 29.5, p = .024, r = .47). Results from the Wilcoxon signed-rank tests indicated that caregivers in the mindfulness group reported a significant reduction in perceived stress (Z = − 2.50, p = .013, r = .75) and anxiety (Z = − 2.81, p = .005, r = .85), whereas the waitlist control group reported higher mean symptoms at the end of the intervention period. Given these promising results, policymakers, health practitioners, and veteran-related programs should increase efforts to provide caregivers of veterans with mindfulness-based interventions to improve mental health outcomes. The authors wish to thank the participants for their time, effort, and commitment. The authors also thank veterans and their caregivers for their service abroad and at home. 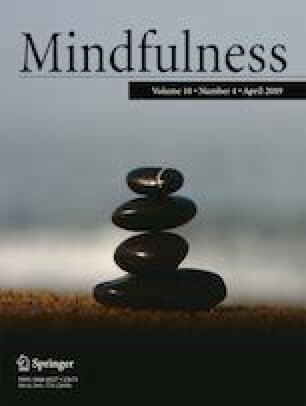 The authors also wish to thank Ellen Ritter for her assistance implementing the intervention, Dr. Sa Shen for her statistical support during revisions, and the Danville Area Community College and Chez Center for Wounded Veterans in Higher Education for providing space to conduct the mindfulness trainings. Sandraluz Lara-Cinisomo was the study’s Principal Investigator. She conceptualized the study, secured funding, developed the study protocol, supervised and trained the research team, conducted the data analysis, wrote the methods and results, and edited the entire manuscript. Ryan L. Santens implemented the intervention, wrote the introduction, contributed to the methods, assisted with data management, and reviewed the entire manuscript. Elinor M. Fujimoto collected and entered the data, assisted with coordination of the study, wrote the discussion, contributed to the introduction, and reviewed the entire manuscript. This project was funded by the Chez Center for Wounded Veterans in Higher Education at the University of Illinois at Urbana-Champaign. The funder was not involved in the development or execution of the project, including data collection and data analysis. All study procedures involving human participants were in accordance with the ethical standards of the University of Illinois at Urbana-Champaign Institutional Review Board and with the 1964 Helsinki declaration and amendments or comparable ethical standards. All participants involved in the study provided written informed consent. Spadaro, K. C. (2017). Effect of mindfulness meditation on short-term weight loss and eating behaviors in overweight and obese adults: a randomized controlled trial. Journal of Complementary and Integrative Medicine, 15(2). https://doi.org/10.1515/jcim-2016-0048.